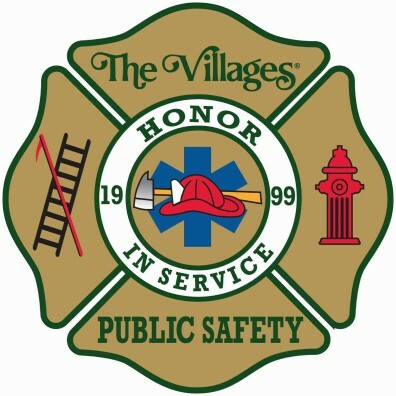 The Villages Fire Rescue was established in 1999 to protect the residents of The Villages. When established, The Villages was a small retirement community in Northern Sumter County and Northeast Lake County. At the time, the department consisted of one fire station, nine firefighters, and one Fire Chief. Today, The Villages Fire Rescue has the honor of serving the world’s largest retirement community. The department’s coverage area exceeds 55 square miles with over 140,000 residents in three counties (Lake, Sumter, Marion) and five cities (Lady Lake, Wildwood, Coleman, Oxford, Fruitland Park). Although predominately a retirement community, the Villages has three family communities and an A+ charter school system (pre-K through 12th). The Villages Fire Rescue has the honor of protecting a population demographic that spans all ages. The Village Fire Rescue is a full-service fire-rescue department operating out of nine stations strategically located to ensure a rapid response to emergencies. The Villages Fire Rescue responded to over 25,000 calls in 2018. 58% of calls were for medical emergencies and the other 42% were fire related calls. Examples of fire related calls include structure fires, vehicle fires, grass fires, fire alarms, motor vehicle collisions and special operations calls such as hazardous materials response and technical rescue responses. The Villages Fire Rescue is proud to have an ISO rating of 2. This is a nationally recognized standard that is based on extensive criteria that evaluates a fire department’s ability to protect its citizens and property. ISO is a third party independent agency that evaluates the fire department, water department and communications systems. It rates the results on a national scale from one to ten (one being the best and highest score). The Villages Fire Rescue’s rating of 2 is rare among American fire departments with only 2% of fire departments in the country obtaining this level. Emergency management and services related to preparation for severe weather, floods, hurricanes and other disaster response activities fall under the purview of the county in which you live. If you have questions on severe weather or other emergency management issues in your area, please contact the appropriate county below. Lake, Marion and Sumter Counties also have programs designed to notify their residents of weather incidents, hazardous conditions and other important information. To sign up for the notifications in your county, please visit the links below or contact the county in which you live for additional information. With respect and dignity, the Villages Public Safety Department will work to prevent harm, and respond to unprevented incidents in an efficient and effective manner with the best resources provided by the community, and be nice!